I self-care on Saturdays. Usually that comes in the form of sleeping in, going to brunch, seeing my therapist, or catching up on whatever television show I failed to catch in real-time. This one Saturday in particular, it also included a trip to Sweet Charlie’s. I wanted something sweet, but mentally flinched at the thought of consuming dairy as we aren’t cool like that. I hadn’t indulged in ice cream rolls since my trip to Kremo, so I was long overdue. As I walked up to the counter to figure out what I wanted, I shrieked internally. 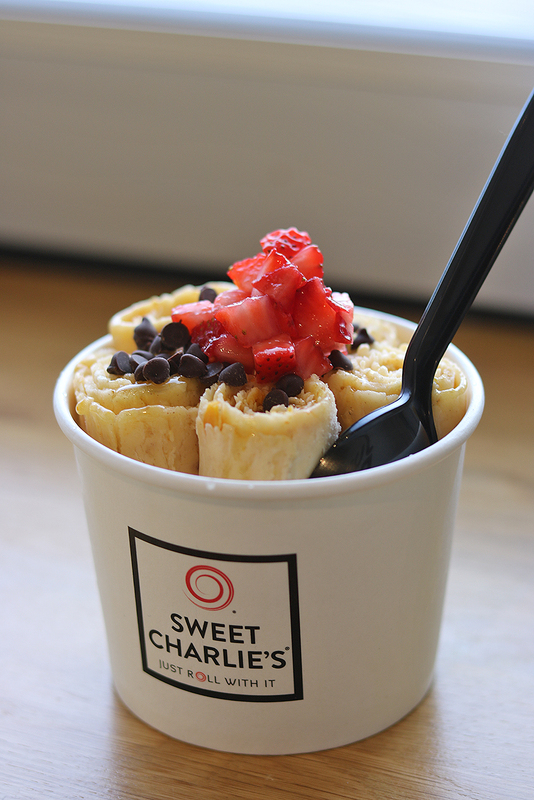 Sweet Charlie’s offers a plant-based ice cream (Nada-Moo) as their base for any flavor or taste one orders. 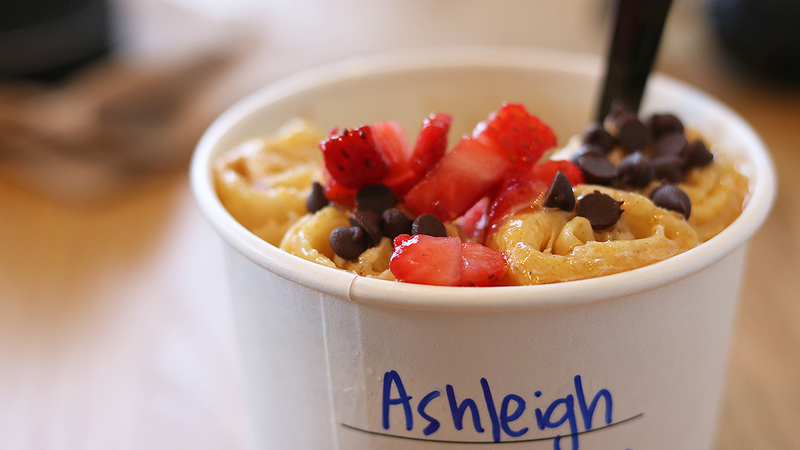 This meant no aching cramps from eating something sweet. Praise emoji hands! 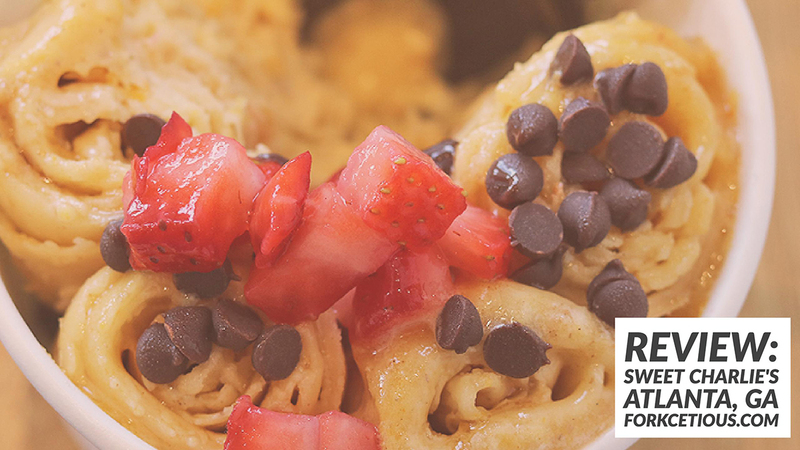 Since it’s fall, Sweet Charlie’s is currently offering a pumpkin spice ice cream. (You saw that coming.) I’m not one to rush towards these types of lattes and pies, but something about a pumpkin spice ice cream intrigued me. (That and the pumpkin scented candle I have at work might have influenced me, too.) I ordered the pumpkin spice ice cream rolls with honey, chocolate chips, and strawberries on top. I know that combo was random, but hey. The sweetest thing I’d ever known was that combination but once I’d got beyond the slight sugar twinge, I savored the pumpkin flavor. It was like when I finally binged all seven seasons of Game of Thrones after attempting it once and swearing to not even because “I can’t with the dragons.” When I finally got into it, I realized it was everythiiinggg. The ice cream was the same. I’m so glad I made Sweet Charlie’s a part of my self-care Saturday. Discovering an ice cream place that caters to us plant-based shawties makes my heart flip like a cartoon cat in love. I’m hooked.